Explanation: There are more than a few stars in our Galaxy. The light from many of them combines to appear as a wisp of faint light across the night sky - the Milky Way. 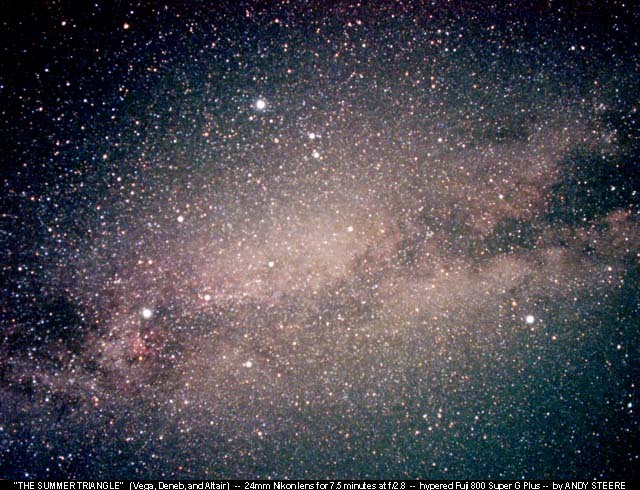 In the northern hemisphere, away from city lights and during the summer months, part of the Milky Way can be seen behind the Summer Triangle of stars - Deneb, Vega, and Altair. These are the brightest three stars in the above photograph, listed from left to right, respectively. If you could collect light in your eyes for 10 minutes at a time (instead of the usual 1/10th of a second), you might see something like the above photograph. Behind the Summer Triangle lies some of the vast star fields of our Milky Way Galaxy, containing literally billions of stars. The dark band across the middle that seems to divide the stars is actually interstellar dust, which absorbs more visible light than it emits and so appears dark.